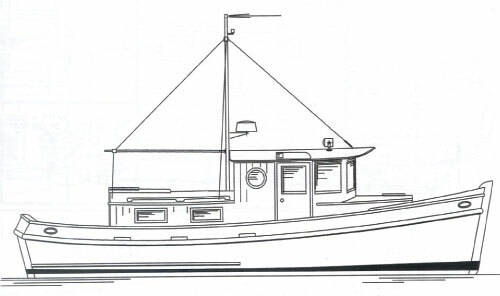 Redwing 34 Tug originated as a custom design, or more specifically a redesign of the Redwing 34 with a traditional tugboat style. The client wanted an economical and easy to build hull with a separate pilothouse. The hull form is proven to be efficient to power with an inboard diesel consuming one gallon per hour at 7 or so knots. That’s real efficiency under power for a boat of this size. Fuel capacity of 120 gallons provides a cruising range of over 500 miles. The boat shown in the photo below was started by Eric Nelson from Louisiana. He completed the hull and was going to have another builder in Boloxi, MS finish it where upon it took a direct hit by Katrina. It made its way through a shrimp packing house and ended up on the other side, full of shrimp. Eric cleaned it up and had it moved to Seaisland Boatworks in South Carolina where it was finished by Mark Bayne and crew. Eric just finished a 1000+ mi trip back from South Carolina to Louisiana. Now that’s a great sea story! Purchase and Download Study Plans for the REDWING 34 TUG for $5.00 in PDF format (zipped file). Purchase Construction Plans for the REDWING 34 TUG for $850.00 for delivery by US Postal Service.